Is your skin dull, tired, itchy or irritated? Here are a few simple remedies to bring your skin back to its vibrant self again. Please note that the following are just a handful of suggestions; and if you have any allergies to these natural remedies, I recommend researching alternative relief as there are a multitude of materials that can be used. Coffee Scrub – Coffee isn’t just for drinking anymore. We already know that coffee stimulates the mind and body from the inside, but did you know it can stimulate the outside of our bodies as well? Simply take those used coffee grounds (freshly brewed ones, not grounds that have sat for a while as coffee grounds can oxidize quickly) and scrub it directly on your skin. The coffee not only wakes up your skin, but also acts as to exfoliate, removing dead skin cells. In addition, coffee contains healthy antioxidants, revitalizing your skin as it works. 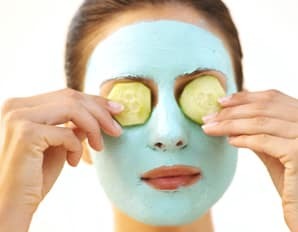 Facial Mask – Puree some cucumber into a pulp. Add in some plain yogurt and honey. Mix well in equal quantities and apply directly to your face. Cucumber is chock full of antioxidants and vitamin E and provides a refreshing cooling sensation. Yogurt provides the creaminess to the mask, and the probiotics (good bacteria) makes skin look and feel younger. The honey thickens the mask, and provides an adhesive quality. But also, honey contains several vitamins and minerals and is good for retaining moisture. Leave on for 10 minutes and wash off. Oatmeal – Using oatmeal for irritated or itchy skin is an old time trick that still works. Mix oatmeal with milk and honey into a paste. Apply to affected skin. Oatmeal is both soothing and drying which is particularly good for bug bites and rashes, specifically poison ivy and poison oak. The oatmeal draws out the venom of the bite or rash by drying it up. The milk and honey puts that moisture back in. Mud – Most of us know that mud can be used for cleansing our pores. But just like the oatmeal recipe above, mud is good for soothing bug bites and rashes. Mud also provides relief to bee stings. Aloe – Aloe is good for everyday use as a moisturizer. Aloe is high in vitamin E. Because of its soothing properties and hypoallergenic nature, just about anyone can use it. For these summer months, its most common application is for sunburn. Many sunburn relief products contain aloe, but buying these products is unnecessary. The extra ingredients are just for show; plain aloe works just fine by itself. If you have dry and/or sensitive skin, stick to using the aloe or cucumber. Some fruits like oranges can be used as long as your skin sensitivity isn’t related to acidity. Also, try tossing in a teaspoon of olive oil to any homemade recipe to boost its moisturizing capabilities. So if you’re having skin issues, the answer could be as close as your own fridge or pantry.